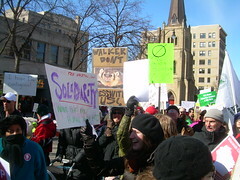 Thousands of workers demonstrated at the state capital in Madison, Wisconsin on February 15 and 16 to protest plans by that state’s Republican Governor Scott Walker to take away the state workers’ union rights. Walker, cleverly attempted to divide the public workers by excluding police and firefighters from his anti-union law, and the media have worked to divide public employees against private sector workers. Yet, both firemen and private sector workers showed up at the statehouse to join public workers of all sorts in what has been one of the largest workers’ demonstrations in the United States in decades. Only California has seen demonstrations as large as these in recent years. Many demonstrators, taking a clue from the rebellions against authoritarian and anti-worker governments that are sweeping the Middle East, carried signs saying, “Let’s negotiate like they do in Egypt.” While the situation in Wisconsin is hardly comparable to the revolution in the Arab world, what we are witnessing is the beginning of a new American workers’ movement. Because this movement is so different than what many expected, it may take us by surprise. Many of us, myself included, had for years expected a rank-and-file workers’ movement to arise out of shop floor struggles in industrial workplaces, out of the fight for union democracy, and out of the process of working-class struggle against the employers. While that perspective still has much validity, something different is happening. The new labour movement that is arising does not start in the industrial working-class (though it will get there soon enough), it does not focus on shop floor issues (though they will no doubt be taken up shortly), it is not primarily motivated by a desire for union democracy (though it will have to fight for union democracy to push forward the leaders it needs). And it does not, as so many American labour movements of the past did remain confined to the economic class struggle (though that too will accelerate). It is from the beginning an inherently labour political movement. The new movement that is arising does not focus on the usual issues of collective bargaining – working conditions, wages, and benefits – but focuses rather on the political and programmatic issues usually taken up by political parties: the very right of workers to bargaining collectively, the state budget priorities, and the tax system which funds the budget. The new labour movement, because it has begun in the public sector, will not be so much about the process of class struggle as it will be about how class struggle finds a voice through political program. This will have tremendous implications for the traditional relations between the organized labour movement and the Democratic Party, especially since the Democrats, from Barack Obama to state governors like Andrew Cuomo, are also demanding that public employees give up wages, benefits, conditions and rights. We have for decades in the United States thought of the working-class as being made up of those workers of railroad, mine and mill whose calloused hands produced the material wealth of this nation over 200 years, that is, since the first factories were opened in the Northeast in the 1790s. Industrial workers though have been declining as a percentage of the population since the 1920s and have diminished at an accelerated rate since the 1950s. Since the 1980s the decline of industrial workers as a proportion of the wage earning class has been dramatic. In the old days, skilled workers, almost all white men, came as immigrants from the countries of Western and Northern Europe, while the unskilled industrial workers were immigrants from the South and East of Europe, whites from Appalachia, and African Americans from the South’s plantations. While most of those industrial workers were male, millions of women also toiled in textile mills, garment shops, and other workplaces. Those workers created the Knights of Labor in 1869, American Federation of Labor (AFL) in 1886, the Industrial Workers of the World (IWW) in 1905, and finally in the great labour upsurge of the 1930s won the legal right to organize with the Wagner Act of 1935 and built the Congress of Industrial Unions (CIO). The post-war period saw the expansion of government as millions found jobs not only in streets and sanitation, the water works, and as teachers, but also as social workers, public health nurses, and college professors. Another labour upsurge in the 1960s and 1970s led to the establishment and rapid growth of public employee unions of all sorts: the American Federation of Teachers (AFT), the National Education Association (NEA), the American Federation of State County and Municipal Employees (AFSCME), and the American Federation of Government Employees (AFGE). These public workers were far more racially diverse than many of the private sector unions, made up white, African American, and Latino workers, of men and many women. Public employees in the 1960s and 70s won the rights to union recognition, collective bargaining, and the strike through hundreds of strikes, large and small during those two decades. The newspapers’ front page often carried the photo of some teacher or social worker, nurse or secretary, sanitation worker or park employee being carried off to jail for striking with the union. The most famous of these strikes, perhaps, was the AFSCME Local 1733 strike by African American sanitation workers of Memphis, Tennessee. Dr. Martin Luther King, Jr., the leader of the civil rights movement, was there to help those workers with their strike, when he was assassinated. Today we in the labour movement are at a turning point. American employers, political parties, and government at all levels have decided that the time has come to move against what is the last bulwark of American unionism: the public employee unions. As of the latest count by the Bureau of Labor Statistics, only 11.9 per cent of all workers are in unions, and only 6.9 per cent in the private sector. In the public sector, however, public employee unions represent some 36.2 per cent of all workers, and the number is even somewhat higher among teachers. America’s political and economic elite are looking for the final solution to the labour problem – and we are not getting on the trains and going to the camps. Public employees, now finding themselves on the frontline of the labour movement, are fighting back from one end of the country to the other and nowhere at the moment so dramatically as in Madison, Wisconsin. Just as the Arab revolution spread rapidly from Tunisia to Egypt, so we can expect to see this public worker movement spread from one state to another as it resists Republican and Democratic party governors and local officials who want to strip workers of their rights. What Sort of a Labour Movement Can We Expect? What does labour history teach us about labour movements? First, we know that when masses of workers go into motion, as they have now begun to do, political consciousness grows and changes rapidly. Workers who today simply fight to defend their union rights will, if they succeed in resisting the right’s attempt to destroy them, go on to fight to expand not only their rights but to improve their working conditions and standard of living. Most important, workers will fight to expand their power. We are just at the beginning. Second, when workers discover the strategy and tactics of their movement, those quickly spread to other groups of workers in society. When the rubber workers in Akron, Ohio discovered the sit-down strike in 1936, it quickly spread not only to the auto industry leading to the great strikes of 1937 and 38. Remarkably, the sit-down also spread to such unlikely workers as the “shop girls” of department stores. During the 1950s and early 1960s, African American civil rights activists rediscovered the power of the sit-down, transforming it into the sit-in in lunch counters, bus stations, and other private and public places across the South. Today public workers in Wisconsin are in search of the strategies and the tactics that can defend their rights, and they are using the mass rally and the camp out at the capital. When they discover or rediscover the strategy and tactics that work, those will spread like wildfire across the country to other public workers – and then jump to the private sector. Third, real labour movements ignore the artificial separation between economic and political, taking up either or both as they follow the logic of the struggle. Industrial workers’ struggles for higher wages in the 1930s became transformed into struggle for the employers’ recognition of the unions and labour legislation granting workers the right to organize. Similarly, public employees in the 1960s fought for the right to organize unions and collective bargaining which then flowed the other way, to a fight for higher wages. What is today primarily a political fight in Wisconsin, that is to defend the right of public employees to have a labour union, bargain collectively and enjoy the right to strike, will inevitably become a struggle for better conditions, higher wages, and health and pension benefits. Fourth, when a real labour movement arises, that is, a movement not merely of thousands or even tens of thousands, but of millions, it necessarily becomes transformative. Labour union officials who hesitate, who waver, or who knuckle under will soon find themselves challenged by new, younger leaders who will either force those officials to fight or push them aside. Such a movement will change the unions – often by changing the leadership first and sometimes by changing the very institutions themselves. Such was the case with the rise of the industrial workers movement in the 1930s which broke the shell of the old AFL to create the new CIO. Fifth, and finally, a new American labour movement of millions will challenge the old political relationship between the unions and the Democratic Party. The unions will fight at first to force the Democratic Party to give up its own conservative budget, tax and labour policies, and failing to do that, will seek another vehicle. Unions may first attempt to change the Democrats by running union candidates in Democratic Party primaries, or they may attempt to take over the state party. Whether the new American labour movement will have the power to put forward a political alternative remains to be seen. Wisconsin though is famous for its long history of political grouping to the left of the Democratic Party which, from time to time, have shown considerable influence: the Socialist Party held power in Milwaukee into the 1960s, the Farmer-Labor Party was once a power in the state, Progressive Dane (county) thrived a couple of decades ago, and the Wisconsin, Green Party has over a score of elected officials throughout the state. None of these was or is what a workers’ movement needs to achieve real political power, but the presence of such political alternatives is indicative of a more tolerant and experimental attitude in the state. American workers have never in their history succeeded in creating a workers’ party of any power, with the exception of the Socialist Party of the early 20th century. Dan La Botz is a labour writer, teacher, and was the Socialist Party candidate for the U.S. Senate in the 2010 election. This article first appeared on the solidarity-us.org website. This entry was posted in All Posts News Politics and-or Videos, Democrats, History, Labor, Politics, Protests, Republicans, Socialism and tagged Activism - Protests - Boycotts, Dan La Botz, Wisconsin, Wisconsin Labor Unions Protests 2011. Bookmark the permalink.